Once upon a time at a local art gallery, there was a community experiment happening. And it’s going really, very well. It would be difficult not to fall in love with a place like The Gallery Havelock. It’s right on the main drag, and the inviting colours of the 50s retro signage, with the locals milling around outside catching up on the local yarns, well, it feels like a community hang out to me. But of course, where else could you find such a great slice of Marlborough artwork in the region? And when you get a peek inside – both the ground level and the now new upstairs – you will see examples of some of Marlborough’s more notable living artists. You’ll catch some Wynn’s, some Cleary’s and Jeffris’ as well as an abundance of Norman Clark bone carvings to name a few – all clamouring for available space around the richly adorned floors and walls. 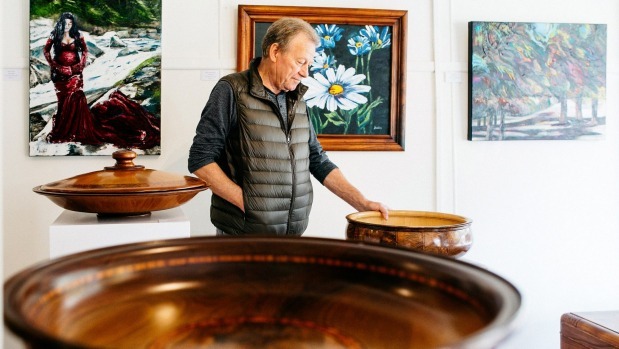 It’s a feast for anyone visiting and wanting a brief tour of the Marlborough art scene. My tour guide for the afternoon is Brett Avison, the gallery director, and he leaves no stone unturned as he takes me around the various pieces. Of course, I am here to cover the latest exhibition called ‘Nature’s Abound’ featuring works from the very wonderful local carver Lionel Jefcoate and painter Saskia Smith. But for now I am happy to take a journey through the beautiful collection of 16 artists held at this comfy venue with Brett. Indeed, Brett directs me through some of the highlights from the 85-year-old carver’s work, many of the carved pieces he has made – including replica sea chests, wheelbarrows, and bowls – from the wood of shipwrecked boats, some lined with Lebanese cedar. It smells like something out of time and place. For Marlborough news straight to your inbox, sign up for our newsletter Marlborough Express Daily. And sure enough, when you lift the lid of the sea chest, a copy of the DSIR report is sitting at the bottom. The carved chest itself, despite its timber pedigree is a rare piece of craftsmanship. It has a bold presence. The Gallery has only been up-and-running since 2014, brought together through a charitable trust. It is very much a community-driven experiment that’s doing very well, thank-you very much. “It’s totally exceeded our expectations,” Brett say. It’s a great experiment that seems to be working, and since the gallery has been open it has given back more than $14,000 to local community projects. Back to the exhibition, which runs to May 11, both Jefcoate and Smith are locals, and while they seem like very different artists, their works displayed together seem to blend seamlessly. While I have talked a fair chunk about the established works of Jefcoate, the younger Saskia Smith’s impressionistic oil paintings of local fauna and flowers from around her Pelorus Bridge locale sing out to you from the walls. They represent a bold and youthful hope, with their courageous and vivid colours – while Jefcoate’s warm wooden pieces around Smith’s paintings express a more stoic wisdom. The voices in the exhibition share a common theme of the artists’ own interaction with their natural world. You can look at the photographs of Jefcoate digging up that old piece of swamp kauri from the sludge and muck, his hands all dirty. I see an artist literally marinated in their natural environment. He intends to bring that forgotten piece of timber back to life. The same is true with Smith’s work. The colours jump off the walls and you get the sense of admiration that the artist feels for her living world. But overall, the curation of the gallery’s pieces feels like an expression of love for community and art. For anyone visiting, the locals love the town and there is an attitude of mutual support for places like the gallery.